What should “the authoritative guide to the brewing techniques and history behind” India pale ale include? – A complete and accurate history of the style, one that addresses the various myths. Check. – Plenty of historic recipes. Check. – Lots of recipes for modern day versions, including many variations, and details about ingredients and process. Check. – All the data beer and brewing geeks could ask for, packed into handy appendices. Check. – An author who knows a little about brewing IPAs. Check. 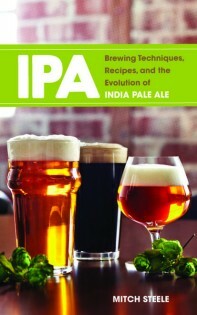 The book is IPA: Brewing Techniques, Recipes and the Evolution of India Pale Ale and the author is Mitch Steele, head brewer at Stone Brewing Company. “Arguably one of the leading authorities on hoppy beer, Steele is currently Stone Brewing Co.’s brewmaster, and his brewery experience ranges from the small-scale San Andreas Brewing Co. to the Anheuser-Busch specialty group. In this new book, he explores the evolution of an influential beer style, India pale ale. IPA covers techniques ranging from water treatment to hopping procedures, including 48 recipes ranging from historical brews to recipes for the most popular contemporary IPAs made by craft brewers such as Deschutes Brewery, Dogfish Head Craft Brewery, Firestone Walker Brewing Company, Pizza Port Brewing and Russian River Brewing Company. More, including details about ordering.